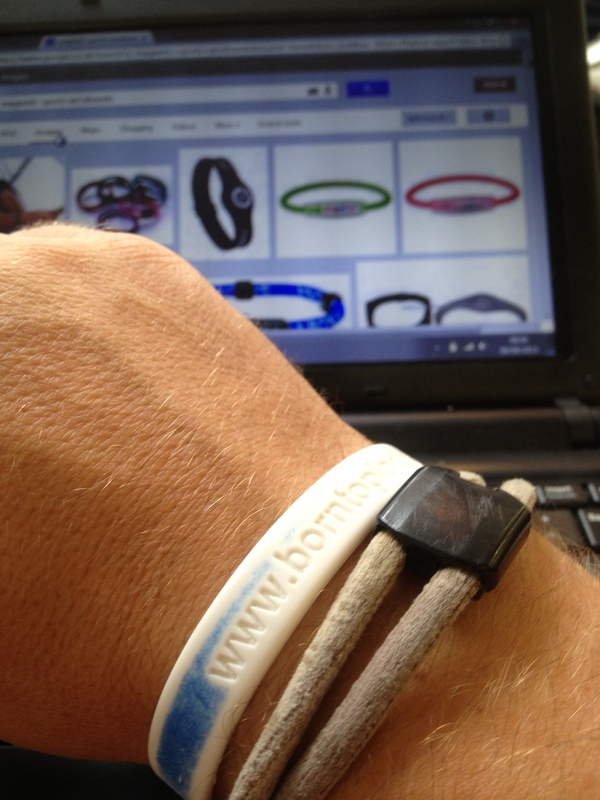 Band on the Run: do magnetic sports wristbands actually work? A couple of years ago, after I’d been into running for a few months, I got myself a magnetic sports wristband. I’d half-read some stuff about the benefits of the various bands on the market (Trion:Z, Bioflow, Ion Loop, MegaMagnoMax Pro*), all sharing the claim that “negative ion” technology could boost performance and/or aid recovery, and all sounding a bit like characters from Transformers. It’s basically just magnets, although another popular sports wristband (Power Balance) uses a hologram instead. According to their website, the hologram design is a depiction of “Eastern philosophies”, which are often associated with energy (and then it waffles on about chakras and chi for a while). To my mind, that’s the equivalent of carrying a photo of a hedgehog in your back pocket to improve your night vision and bristliness (which I do, because you can never be sure). These companies don’t just do wristbands though; some also make pet collars using the same technology. A friend of mine had bought one for his arthritic dog and had reported amazing results. So, as I’m one-quarter patterdale terrier on my father’s side and don’t have enough commitment to be a true sceptic, I decided to order one. A wristband, I mean, not a collar. My right wrist instantly became a few grams heavier. It didn’t make me feel stronger or faster (to be fair, it hadn’t claimed to, but a guy can hope), I didn’t suddenly feel attuned to the universe, and it didn’t instantly confer on me the ability to communicate with ducks (and believe me, I tried). But I kept wearing it, and I’ve continued to wear it for two years now. Y’see, I’ve since spoken to a lot of people who rate these wristbands very highly. People who’d previously struggled with joint pain, arthritis and poor circulation raved about how their suffering had eased drastically since they began to wear these diddy little magnets on their wrists. I didn’t have any of those conditions, but I’ve now convinced myself that I could have developed them over the last couple of years but just haven’t realised it because the symptoms are being masked by my wristband. Basically, I’m now too scared to stop wearing it in case my legs fall off. Secretly hoping for some magical effect that would boost my performance overnight. The same feeling of hope you get when you lace up a new pair of running shoes that boast the latest innovation in shoe technology. I’ve always been a bit evangelical about running, and I wanted the world to know I was a runner, even when I was “off duty”. In hindsight, it would take a lot more than a wristband to convince people I’m a runner, even while I’m running (especially while I’m running). So, if any of you were reading this in the hope that it’d end with a definitive answer to the question “do these things actually work, or am I better off just saving my money and carrying a lucky rock everywhere with me?” then I’m sorry to disappoint. There are countless reports available online that take a much more sciencey approach, and a multitude of forums where people will swear blind that these things are amazing/just a placebo/the work of the devil. Now, if anyone wants to buy a lucky rock, I have some available at the bargain price of just £19.99 each, or £5.99 for a handful of enchanted gravel**. * I only made one of those up, but it’s just a matter of time until some marketing consultant uses it for real. ** IMPORTANT LEGAL NOTICE: The words “lucky” and “enchanted” are used for marketing purposes only and represent no guarantee of luck or enchantment. You luck may go up as well as down. The seller reserves the right to demand immediate return of products if they do actually turn out to be magical. Your trousers may be repossessed if you do not keep up payments. “Born to Plod Lucky Rock Industries” is a non-profit organisation, except it isn’t, and I’d really like a motorbike and a pet tiger and loads of other expensive stuff. Poll: Why am I not broken? I opened the post, saw the picture and immediately though “that’s the wrist of a runner, right there!” so it clearly works. Love the product reviews, Jay. Honest and hilarious in equal measure. Apropos of nothing, it’s about time you did B2PQ&A! thank you. i suspect its a a placebo effect, but beautifully written up. Can I quote your “luck” disclaimer?